Forty-four percent of Latino adults do not use the internet. The offline Latino population is characterized by lower educational attainment and a lower likelihood to speak English. 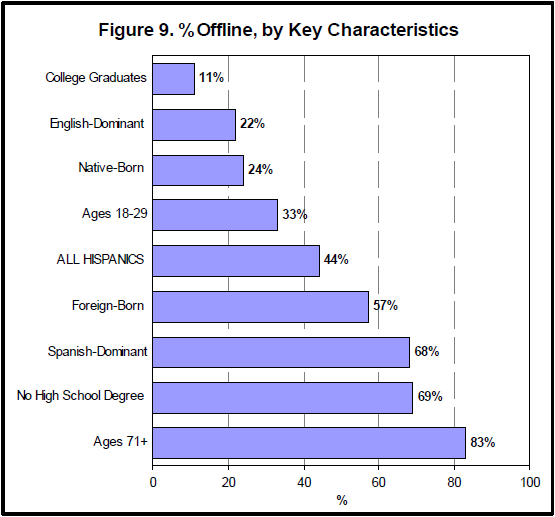 Fully 69% of Hispanics who did not complete high school and 68% of Spanish-dominant Hispanics are offline. Of Latinos who do not go online, 53% say they simply do not have access. In addition, 18% of non-user Latino adults say they are not interested in going online, 10% say going online is too difficult or frustrating, 6% say it is too expensive to get access, and 5% say they are too busy or do not have the time to go online. However, Hispanics are less likely than non-Hispanic whites to own a cell phone. Fully 75% of non-Hispanic white adults have a cell phone and 31% of white cell phone users send and receive text messages on their phone.13 By comparison, 59% of Latino adults have a cell phone and 49% of Latino cell phone users send and receive text messages on their phone. Looking at the numbers in a different way, 56% of Latino adults go online, 18% of Latino adults have a cell phone but do not go online, and 24% of Latino adults have neither a cell phone nor an internet connection. Cell phone ownership is associated with essentially the same demographic characteristics as internet usage. For example, cell phone use is markedly lower for Spanish-speakers: 42% have a mobile phone, compared with 75% of English-dominant Latinos. Nativeborn Latinos are more likely than foreign-born Latinos to use a cell phone – 72% versus 50%. However, Latinos over age 60 are more likely to have a cell phone than an internet connection, which is also true in the non-Hispanic population.